The Transport Select Committee (TSC) recently released their report on the government’s plans to build a 3rd runway at Heathrow. It shows how the plan is completely incompatible with the UK’s climate obligations. Yet the carbon emissions from a 50% larger Heathrow were given the briefest of mentions in the summary, and crucial issues are tucked away in the final annex of the TSC report. The Campaign Against Climate Change has explained some of the dubious assumptions being made by the DfT, in order to imply carbon is not a key limiter of the scheme. One assumption is that CO2 emissions from air travel can be excluded from calculations of economic impact – but the CO2 from flights is over 96% of emissions resulting from aviation. Then there is the assumption that carbon trading is an effective way of compensating for the increase in aviation emissions. The DfT hopes – unjustifiably – that aviation CO2 can be ignored, since they will be completely removed through carbon trading. The Committee on Climate Change has consistently warned against relying on carbon trading. And there is the assumption that biofuels could be used to reduce aviation CO2. The only economically viable fuel would be palm oil, with devastating environmental impacts. MPs voting on the NPS need to be aware of these facts. The Transport Select Committee recently released their report on the government’s plans to build a third runway at Heathrow. If you read the report in full, it is clear why this plan is completely incompatible with our climate obligations. Unsurprisingly, media coverage focused on those issues which were given more prominence, including air pollution, noise and public transport limitations. 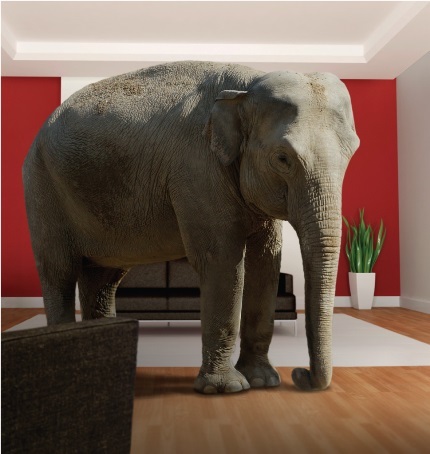 But the committee’s evidence-gathering can shine a light on some of the more extraordinary ‘assumptions’ being used by the government in its calculations around climate impact. These ‘assumptions’ are being used to avoid discussion of the damaging impact a third Heathrow runway would have on our climate targets, keeping MPs in the dark in the run up to this summer’s Parliamentary vote on the scheme. 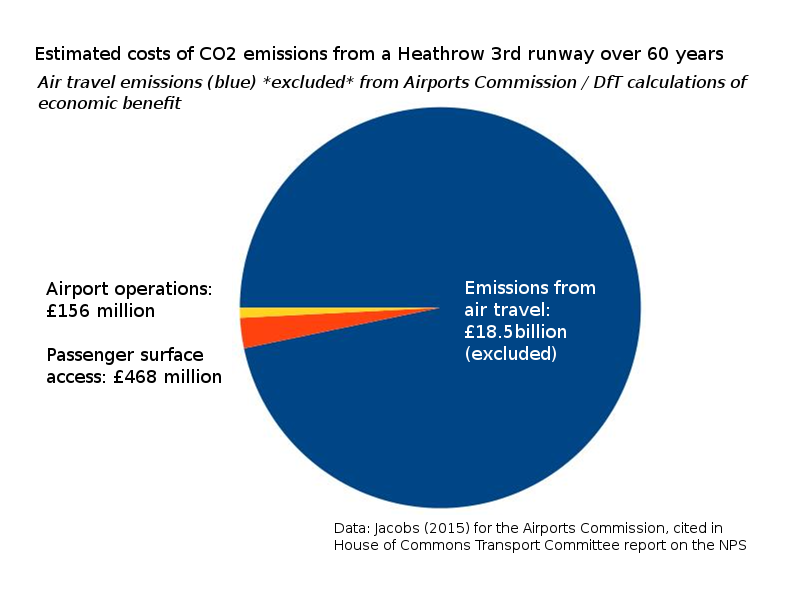 The Airports Commission included an estimate of the economic damage done by additional carbon emissions from a new runway in its cost/benefit analysis. But this excluded the over 96% of emissions resulting from air travel itself. Apparently, these do not need consideration since they will be completely removed through carbon trading. [Which, of course, is utter nonsense…. AW comment]. The Department for Transport has revised the figures but continued to exclude emissions from air travel. This assumption underlies the government’s dismissal of the hefty carbon emissions from around 700 extra flights a day from economic calculations around a third runway. It is also being used to justify ignoring the Committee on Climate Change’s recommendations for a cap on aviation emissions of 37.5Mt CO2. This would be a significant step – the first time since the Climate Change Act was passed that the government dismissed outright the Committee’s recommended limitations for emissions. Another major problem with using carbon trading for aviation is that aviation’s climate change impact is around double what it appears from looking at CO2 alone (from other gases emitted and the formation of contrails). Professor Piers Forster informed the committee that once these were accounted for, the cost estimate for climate damages for flying would be doubled from £18.5 billion to over £36 billion – and carbon trading would only limit less than half of this. Witnesses to the committee questioned the assumption that sustainable biofuels would be available in sufficient quantity. This has been examined in more detail elsewhere. For example, a report by Biofuelwatch argues that the only biofuel which currently appears feasible for use at scale is palm oil – and the expansion of palm oil cultivation would be far from good news for the climate. In the most recent figures produced by the Department for Transport, the expected future carbon emissions have been reduced, compared to those produced four years previously. This is attributed to predictions that more efficient aircraft will be built sooner, and that passenger numbers per aircraft will increase. Other measures that were proposed as means of reducing emissions (without limiting demand) included incentivising the use of single-engine taxiing at UK airports and regulations to improve the fuel efficiency of aircraft. There was no fall-back plan explained if these were not as effective as was hoped. While there are many environmental and economic reasons to reject the building of a third runway at Heathrow, the most important one is that it would seriously undermine our climate targets. As the world heats up, no government that claims to take climate change seriously could approve this plan. We need to make it clear that any MP voting for Heathrow expansion is voting to put the profits of Heathrow Airport Holdings Ltd (HAL – formerly BAA) above the wider interests of the UK and the future of our planet. Posted: Thursday, March 29th, 2018. Filed in Climate Change News, News about Airports, Recent News.